Mahinda Rajapaksa is attempting to obtain the support of Western and European countries to remain in the premiership, according to ‘Lanka’. The Parliamentary session for the day commenced a short while ago presided by Speaker Karu Jayasuriya. The session commenced without the attendance of the governing party MPs as they have boycotted today’s (30) parliamentary session. The Permanent High Court Trial-at-Bar yesterday (29) heard the case against former President’s Chief of Staff Gamini Senarath and three others for allegedly misappropriating Rs 500 million in funds belong to Litro Gas. UNP Deputy Leader Sajith Premadasa yesterday said he had declined to oblige President Maithripala Sirisena when he offered him the post of Prime Minister ten times. Speaker Karu Jayasuriya has appointed a committee to look into the recent incidents that took place in Parliament. 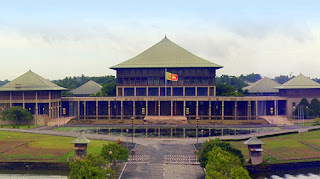 Office of the Speaker stated that Speaker Karu Jayasuriya is set to meet President Maithripala Sirisena today (29). Accordingly, the meeting will be held at the Presidential Secretariat at 4 pm this evening. The ruling party parliamentarians will be boycotting the parliamentary session today (29), stated Minister S. B. Dissanayake. The government MPs boycotted the last two sessions of the parliament as well. The UNP's Parliamentary Group had unanimously decided that its leader Ranil Wickremesinghe should be the one, who should become Prime Minister as long the party had a majority in Parliament, party sources said. The Government yesteray said it was optimistic that a majority of MPs would vote to pass the Vote on Account (VoA) as it was a matter of national interest. Responding to a statement made by President Maithripala Sirisena that he will not appoint him as the Prime Minister again; UNP Leader Ranil Wickremesinghe yesterday said the President has to offer the post to anyone chosen by Parliament. The special trial-at-bar at the Colombo High Court yesterday once again postponed the trial against former Defence Secretary Gotabaya Rajapaksa and six others for December 8 on observing that the prosecution had still not tendered some of the documents on the case to the defence. Police have commenced investigations on five complaints regarding the tense situations which occurred during the recent parliamentary sessions. United National Party (UNP) MP Field Marshal Sarath Fonseka today requested Speaker Karu Jayasuriya to summon IGP Pujitha Jayasundara to Parliament within 48 hours, over the recent remarks made by the President with regard to the alleged assassination plot. The United National Party (UNP) said today that President Maithripala Sirisena should equally share the blame as the Head of State and the Head of the Government if there was any corruption during the past three and half years. England beat Sri Lanka by 42 runs in the third Test in Colombo on Monday to claim their first overseas whitewash in a three-match series in 55 years. Spinners Jack Leach and Moeen Ali took four wickets each to help bowl out Sri Lanka, who were chasing a daunting 327 for victory, for 284 in the final session on day four. Ahead of another parliamentary vote to curtail expenditure to the Office of Prime Minister, the government is making fresh efforts to muster the simple majority, a Minister said yesterday. Responding to the statement that have been made by President Maithripala Sirisena that he is willing to appoint an alternative Prime Minister if a member of Parliament proves he has a majority, the UNP yesterday said it cannot think of a new way to show a majority as they have already proved it. A school prefect studying for his A/Ls in the Maths Stream who got into a fight with a Grade 9 student after the latter took umbrage at being disciplined by a senior, succumbed to his injuries yesterday while undergoing treatment in the intensive care unit of the Kalutara Nagoda Hospital for a head injury. A discussion will be held between the Inspector General of Police (IGP) and senior officials and President Maithripala Sirisena today (26). President Maithripala Sirisena on Sunday reignited the power struggle that has crippled Sri Lanka's government for more than a month, vowing never to reappoint arch-rival Ranil Wickremesinghe as prime minister. President Maithripala Sirisena told the Commonwealth Secretary General, Baroness Patricia Scotland that he has acted in accordance with the Constitution of Sri Lanka and would continue to stand for democratic practices. As many as 122 Sri Lankan lawmakers on Friday challenged former President Mahinda Rajapaksa at the court of appeal, asking on whose authority he occupied the office of the Prime Minister, after being voted out in the legislature, The Hindu reported. The appeal filed by the Attorney General against the acquittal of Ven. Gnanasara Thero and 12 others over the case filed for allegedly attacking and causing damages to the Calvary Christian Center in Malabe, has been withdrawn from the Supreme Court. JVP MP Vijitha Herath today proposed that Parliament acts immediately to find solutions with regard to the collapsing of Sri Lanka’s economy due to the prevailing political crisis and the hardships faced by the general public as a result of this.